The Dutch scholar Erasmus was the dominant figure of the early sixteenth-century humanist movement (a movement during the Renaissance period devoted to human welfare). The intellectual middleman (one who negotiates) during the last years of Christian unity, he remains one of European culture's most controversial figures. Desiderius Erasmus was born in Rotterdam, Netherlands, probably on October 27, 1466, the second son of a priest, Roger Gerard, and Margaret, a physician's daughter. His parents were unmarried at the time of his birth. School life shaped Erasmus from his fifth year onward. His parents enrolled him and his brother at a school in Deventer with the Brethren of the Common Life from 1475 to 1484. Around 1484 his parents died of the plague (a highly contagious disease that results in the deaths of large numbers of people) and their appointed guardians sent the boys to another, more conservative school also run by the Brethren for three more years. From this religious community, Erasmus was educated in classical Latin and developed an appreciation of Christianity beyond its traditional basis. Erasmus entered the Augustinian monastery (a house of monks who have taken vows to dedicate their lives to religion) at Steyn in 1487 and took monastic vows in 1488; he was ordained (officially installed in a church position) a priest in 1492. Erasmus found Steyn crude and rustic. His intellectual abilities offered the first step out, when the bishop of Cambrai employed Erasmus as his secretary in 1493 and rewarded his work with a salary for study in Paris, France, in 1495. Paris provided a different environment for Erasmus. He moved in scholarly circles, writing poetry and experimenting with styles of educational writing that later became the publications Adagia and Colloquia. He sought students and patrons (people who give financial support to artists or writers) until 1499, when a student took him to England. The visit to England was life changing for Erasmus. English humanists were studying Scripture (Biblical writings) and the early Church leaders, and working toward reform of the Catholic Church and the educational process that served it. Friendships with John Colet (c. 1467–1519), Sir Thomas More (c. 1477–1535), and others inspired Erasmus's interest in religious studies and turned him to the Greek language as the key for his research. Enchiridion militis Christiani (Handbook of the Militant Christian, published 1503, though begun a decade before) outlined conduct that would further man's spiritual growth and bring about the moral principles and godliness of what Erasmus's group called the "philosophy of Christ." In 1506 Erasmus traveled to Italy. He anonymously (without giving a name or an identity) published Julius exclusus (he never admitted authorship), in which St. Peter bars Julius (then Pope Julius II [1443–1513] who was waging war with Bologna in Italy) from heaven and harshly speaks against his wars and treasure. Erasmus polished his Greek in Italy and formed a relationship with the printing house of Aldus Manutius in Venice, the first link to publishing his writings that secured his financial and professional independence. Back in England by 1509, disappointed with the Church's wars and its clergy's weaknesses, Erasmus wrote Encomium moriae (The Praise of Folly), a commentary of the obstacles restricting the fulfillment of Christ's teaching. 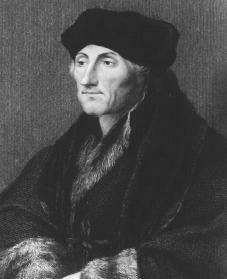 Though not formally released from monastic vows until 1517, Erasmus was now freed of Steyn by his mounting reputation. He worked as a professor at Cambridge (1511–1514) and settled into the occupation for which his study and travel had prepared him . Erasmus's Novum instrumentum, a heavily explained edition of the New Testament placing texts in Greek and revised Latin side by side, appeared in 1516. It was a turning point for scholars and reformers that brought educated Europeans closer to Erasmus's early works, and paved the way for the literary and educational classics of the Christian humanist society. Erasmus then returned to Europe to continue his efforts and resume the circulation of his works. Froben published his nine-volume edition of St. Jerome in 1516 and in the next two decades issued Erasmus's extensive editions of early Christian authors, including St. Cyprian (1520), St. Ambrose (1527), and St. Augustine (1529); he also circulated critical writings and essays on immortality and revised editions of the literary works. of Peace), speaking against war as an instrument of oppression (the act of keeping down, or suppressing, by forceful authority) and warning rulers to fulfill their obligation to preserve Christian harmony. Erasmus thus demonstrated his sensitivity to Europe's approaching split in the Christian Church. Erasmus's influence could not accomplish the vision of Christian renovation expressed in his New Testament dedication and preface, which urged Pope Leo X (1457–1521) to make Rome the center of reform and to make Christ's words available to every commoner who wished to read it. Following Martin Luther's (1483–1546) lead, many intellectuals, impatient for action, used publications and speaking platforms to move Europe's masses as Erasmus never had. The Erasmians's style of persuasion was replaced by simpler, informal commentaries on theology (the study of God and the Christian religion), the Sacraments, and Church structure, sometimes linked with social and political issues. Erasmus's eventual response, after an important exchange with Luther in 1524 and 1525, about the role of human will in salvation to which he contributed De libero arbitrio (On the Freedom of the Will), was a gradual separation from the theologians who held a different opinion and their wealthy sponsors. Erasmus died on July 12, 1536. The Catholic Church, which he never left, rejected some of Erasmus's work for its critical attitude and moderation against those who held different beliefs, while opinion based on Protestant, authoritative viewpoints has judged him harshly. But there is a rebirth of interest in, and sympathy for, Erasmus and his belief that patience and logical reasoning must be the controlling factor through conflicting times. Bainton, Roland H. Erasmus of Christendom. New York: Scribner, 1969. Dolan, John P. The Essential Erasmus. New York: New American Library, 1964. Erasmus, Desiderius. The Adages of Erasmus. Edited by William Barker. Toronto: University of Toronto Press, 2001. Popkin, Richard Henry. The History of Skepticism From Erasmus to Spinoza. Berkeley: University of California Press, 1979.